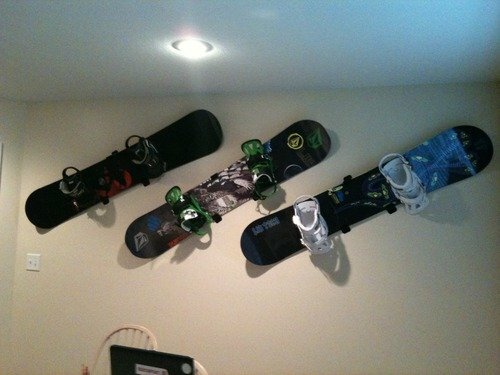 Listing is for 3 snowboard / wakeboard wall mounting kits. Hangs 3 board on the wall. Check out our other listings for single racks and your choice of 6 different colors! Board Mounting Kits are made form Strong Steel. Great for hanging boards with bindings. With hang Tight Kits you can hang your boards horizontally or at a slant up to 45 degree. Strong steel construction but safe, smooth edges. Kits are coated with highly Durable neoprene foam protects you board from any type of damage. Kits can be mounted indoors or out and are water resistant!. Easy 3 step insulation. Quality mounting hardware and instructions included with the kit. You boards can be removed from the wall with easily and at any time. Get a deal on a rock star rack!. Makes a great gift! The Original Hang Tight Racks "Hang it right with Hang Tight" TM. . One purchase Hangs 3 snowboards or wakeboards. Please note Clips are made of steel not real carbon fiber although the carbon fiber look real. Satisfaction Guaranteed! If you have any questions about this product by Hang Tight Racks, contact us by completing and submitting the form below. If you are looking for a specif part number, please include it with your message.